Precision Electro-Chemical Machining (PECM) was developed from ECM through two key developments: the minimization of the machining gap (through which the electrolyte solution flows) and the necessary exchange of the electrolyte itself. On one hand, the gap for PECM has to be particularly narrow to achieve a decent reproduction. At the same time, an overlaid mechanical, oscillatory movement ensures that the electrolyte is properly replaced and renewed. To further ensure that the current flows easily during the tool movement, a pulsed, freely programmable power source is employed. That is why precision electro-chemical machining makes for such an effective and precise removal of the material. The technology experts from EMAG also design complete solutions for the electro-chemical metal removal with PECM technology, and adapt them to suit individual customer requirements. Power electronics and generator technology are both a modular design to allow optimal scaling for every individual application. Demands made on components for turbine manufacturing are increasing. Efficiency levels of turbines have to remain optimal at all times. This is achieved with increased speeds and improved pressure ratios. This, however, leads to greater stress on the compressor impellor. For this reason the rotor is often manufactured as an integrated component (blade integrated disk = blisk), using high-tensile materials. To ensure that the complex geometry of blisks and their materials - nickel-based alloys and often even titanium alloys - can be machined efficiently, new processes, such as precision electro-chemical machining (PECM) are in demand. The processes guarantee low tool wear, a high degree of reproducibility and precision surface finishes. Furthermore, there is no burr formation with ECM and PECM. For the complete-machining of blades or blisks dividing the work into a rough-machining (ECM) and a finish-machining (PECM) operation is recommended. Scalable power electronics and generator technology are used to adapt the precision electro-chemical machining process to individual customer requirements. 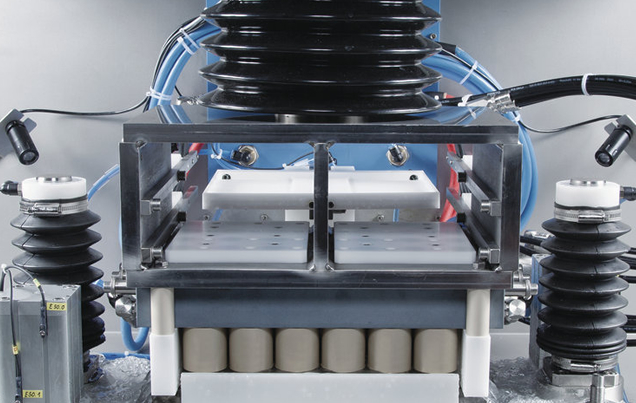 EMAG's success is based on its modular machine concept. Smaller motors, greater power. The catchword "Downsizing" indicates that turbochargers are becoming more and more important in passenger car production. The consequence: central components of the turbocharger - such as turbine wheels and rotors - have to be produced with great efficiency and in large numbers. With the use of high-tensile materials, such as Inconel, the chipping process has reached its limits. Precision electro-chemical machining (PECM) opens up new opportunities in this respect. The components are produced with great dimensional accuracy, and there is no burr formation. Downstream surface machining operations become unnecessary. On top: the hardness of the material has no adverse influence on feedrates. Precision electro-chemical machining reduces the costs of producing turbochargers. With PECM, too, EMAG relys on a modular machine concept. Power electronics and generator technology are adapted to suit customer requirements.